Barberton … founded in 1884 by two brothers, Fred and Harry Barber along with cousin Graham Barber, from Natal, now known in these time as Kwazulu Natal. They discovered what they called the “Barber’s Reef” – a reef so rich in wealth that it glittered with gold. Word traveled like wildfire and a rush of diggers began arriving on the scene and a mass of shacks, stores and canteens sprang up all over. 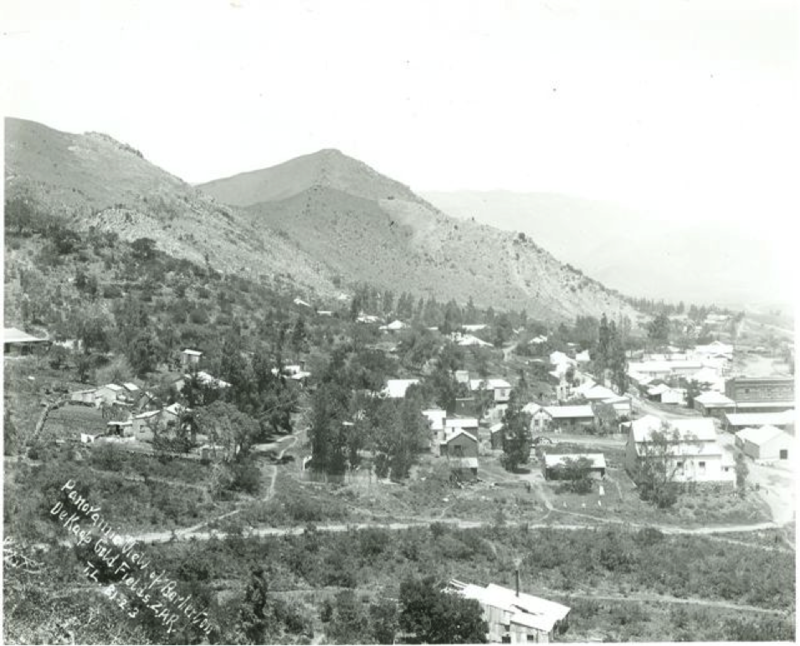 On June 1884 David Wilson, a mining commissioner of the De Kaap Valley broke a bottle of gin over a lump of rock to christen the town, thus launching its lively career. Tom McLachlan first discovered gold in the De Kaap Valley in January 1874. It was not economically viable but he stated that if prospected properly then, he believed rich deposits would be found. The speed with which the town of Barberton grew was astonishing. During 1886 Barberton was at the height of its boom. Two stock exchanges traded night and day. Dozens of canteens, liquor shops and music halls competed with the mines to make the greatest profits in town. Gold was found on the farms Ameide and Oorschot, three to five miles west of the present town of Barberton, forming part of the block of 13 farms constituting “Moodie’s” concession – given to him by the Transvaal government for his work surveying a railway route from Delagoa Bay, now Maputo, to Pretoria. The Transvaal government had no money to pay Moodie so he was given 13 farms for his efforts. Auguste Robert known as “FRENCH BOB”, discovered gold on the North Kaap River and pegged the first claims at what became James Town in “The Valley of Death” in 1883, this led to the Barberton gold rush. James Town was named after Ingram James who was the first person to discover alluvial gold in the Noord Kaap River ” French Bob” approached Moodie for the right to mine under special privilege as discoverer, which Moodie had no right to grant. He was willing to trade fairly with “French Bob” , but from the other diggers he claimed high licence fees and royalty on gold won. In terms of the Gold Law any licence’s were payable to the state and the owner was entitled to half of such licence moneys. The diggers rightly refused to pay licence’s and royalty to Moodie, and also refused to quit working. An impasse ensued and Moodie commissioned Henry Nourse to act on his behalf. Nourse arrived, but on his way met Fred and Henry Barber and their cousin Graham, all experienced hunters, with a party en route to the hunting veld. They decided to go with Nourse. The diggers,under the leadership of Henry Culverwell, refused to pay Moodie anything but also refused to quit. Eventually Culverwell and 28 others were arrested and taken to Pretoria where they were charged and acquitted, but Moodie obtained an interdict against them and they had to cease work. Moodie however, had to realize that he himself had no right to mine or permit mining, and it was not until August 1885 that he got a mining concession. 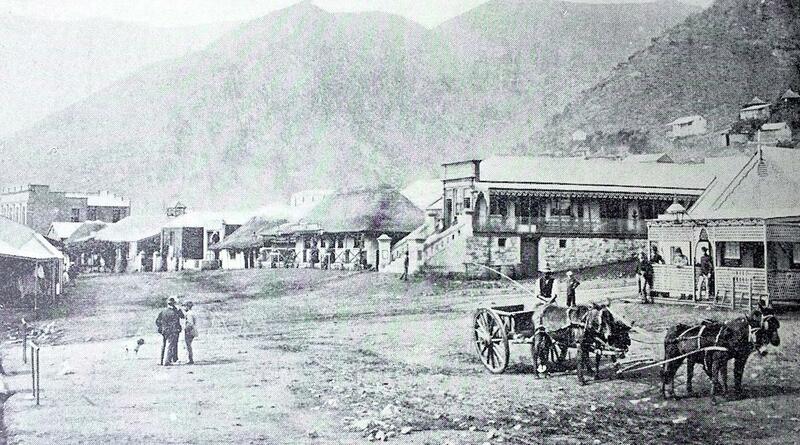 Eventually all the 13 farms of Moodie’s Concession were brought within the Zuidkaap Goldfields on 28th May 1889. Meanwhile, the Barber brothers tried their hands at prospecting, and found payable gold in a creek close to the northern boundary of the Moodie’s Concession farm, Brommers, immediately above the present town of Barberton. A gold rush followed, and Barber’s Camp became a hive of activity. A Diggers Committee was formed. Other towns sprang up, such as , Eureka City. At the height of the rush, Eureka City had a population of 650 men and a handful of women.It was soon even wilder and more lawless than Barberton! It had three hotels, about a dozen canteens, a race track, music hall and some of the flashiest barmaids in the De Kaap Valley. Too much money was spent with too little profit to show for it. Some companies like Sheba remained and carried Barberton through this difficult period. Eureka City’s ruins lie high in the hills on the north eastern side of the De Kaap Valley. A track from Barberton takes visitors to the site, but there is not a single inhabitant. The Market Square was the centre of the town’s life. Farmers would come to town spend the night, sell their produce the next day and then leave. Their wagons were left unattended when they were in town and it was accepted that anything on the wagons was safe. Goods started disappearing and soon the culprit, a Chinaman, was caught stealing. He was dragged to a Marula tree and hanged by his neck. Pat Murphy the local policeman rushed to the scene and cut him loose. The Chinaman fled and was never seen again in Barberton. Places of historical interest in Barberton include the Lewis and Marks Building, the first double storey structure in Transvaal: The Gold Stock exchange (1887), Fernlea House (1893), Belhaven and Stopworth House (1886). The Barberton Museum, on Pilgrim’s Street, houses displays excellent exhibits on aspects of early life in Barberton. More on Barberton and It’s History – Coming Soon!!!! As one travels from Barberton along the R38 motorway towards Kaapmuiden, one is able to view the railway joining these two places until a point where it disappears behind a low hill. It was behind this eminence that the worst rail accident of the Anglo-Boer War occurred. On Easter Sunday, 30 March 1902, a train carrying soldiers and civilians left the rails there, incurring the deaths of 49 people. This is country where the diggings of the gold rush of 1885 had left their mark, evident in names such as Digger’s Retreat, Joe’s Luck, Low’s Creek, Rimer’s Creek, and Hyslop’s Creek. Railway accidents were not unusual during the war. A train accident at Frederickstad on 30 July 1900 left fifteen soldiers dead; at Daspoort near Pretoria nine soldiers were killed in an accident on 7 June 1901; and in another mishap in the same vicinity on 5 May 1902 another fifteen soldiers died. 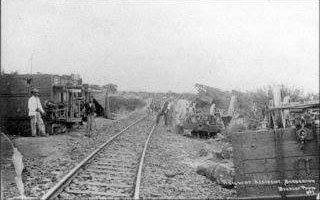 At Machavie near Klerksdorp a derailment of a troop train on 12 April 1902 resulted in the deaths of sixteen servicemen. The second party of 105 soldiers was ordered to leave on Easter Sunday, 30 March 1902. It comprised three officers, 31 non-officers of ‘E’ Company, 29 non-officers of ‘C’ Company, and 39 non-officers of the Volunteer Service Company (Militia) and three details. (2) They entrained at Barberton railway station at 08.00. The train consisted of seven open trucks coupled behind the locomotive, the fourth and fifth occupied by the Volunteer Company, the sixth and seventh by ‘E’ Company. Then followed a ‘boy’ truck, a passenger coach and two more open trucks occupied by ‘C’ Company. The coach contained the three officers and some civilians. The rail route from Barberton Station to Kaapmuiden descends 200 metres in altitude over a distance of 7 km. 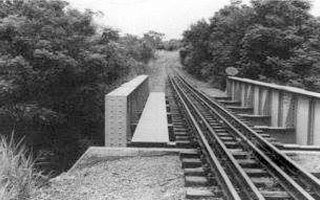 At a distance of 6,7 km the railway takes a sharp bend of 90° to the right through a distance of 250 metres, then, after a short distance, the track turns 45° to the left through 200 metres, beyond which a straight stretch crosses Hyslop’s Creek. 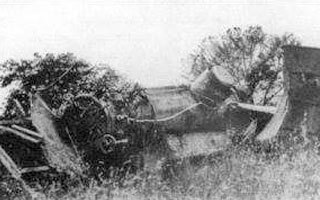 (5) At the first sharp bend, the engine hurtled into the air, turned a complete somersault, and the boiler burst as it reached the ground. (6) The couplings having been broken, ‘the rest of the train rushed on at terrible speed. One truck, about 60 yards [54 metres] beyond the engine, rolled several times’ before coming to a rest on its side. 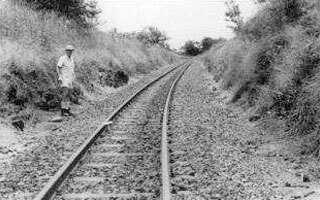 (7) ‘Three others left the line almost simultaneously, and the fragments were piled in a heap thirty yards [27 metres] from the rails. (9) the other rolled to the edge of the abyss but not before throwing its occupants out and falling onto them. (10) From this truck, 22 dead soldiers were removed. Another eight were badly injured, of whom two died later. (11) The ‘store’ truck, the ‘boy’ truck, the passenger coach, and two open trucks next to the van and the van itself crossed the culvert. The wheels of the coach and van left the rails, those on the left side running between the tracks along the middle of the foot board of the bridge and those on the right running along the outer girder to within 75 mm of the edge. (12) With great presence of mind, the guard, named Ross, applied the handbrake and ‘undoubtedly saved the passenger coach from being hurled into the donga [ravine]’. (13) However, the coach was wrecked. In an attempt to ensure his safety, one passenger, a Mr William John White, had jumped off before the coach reached the bridge and he was afterwards found dead at the bottom of the ravine. (14) None of the passengers in the coach was seriously hurt except a Boer woman from the Barberton Concentration Camp, who died later. (15) The ‘boy’ truck was tilted on its side, whilst the buffer of the ‘store’ truck in front smashed into its end. (16) The doors of the ‘boy’ truck had closed themselves during the final smash and its occupants were released by a man who managed to open the upper door from the outside with great difficulty. (17) Today the cutting affords a less steep gradient for the railway. In the 1950s, the original wooden sleepers were replaced by metal ones. Apart from these modifications, however, little has changed over the past 98 years. A scene of terrible carnage presented itself. Every vehicle was either derailed or capsized ‘while the sight of the killed and injured was appalling’. (21) The engine was the first component to leave the rails. After somersaulting, the locomotive came to a rest, the boiler bursting on impact. The view today of the bridge over Hyslop’s Creek. The sharp 45° bend is visible in the distance. It was there that only eight of the original fourteen units of the train remained on the rails. Guide rails between the tracks serve to prevent a derailment. The stoker, a man named Constance, unconscious and badly injured, died while being conveyed to Barberton. There not being another locomotive in Barberton, the military ambulances were sent out by road and arrived at the scene within an hour of the accident. 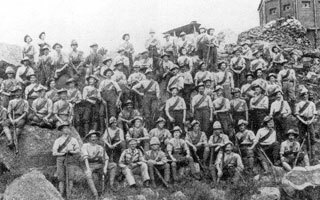 (23) Every available nurse and doctor and medical personnel of the Royal Army Medical Corps assisted in the hospitalisation of the injured and before 13.00 all the injured and the dead were in hospital in Barberton. Mr White was buried that afternoon. Men of the Volunteer Service Company, Hampshire Regiment, pose for a photograph near Barberton. In the background is a blockhouse of an early design. Sadly, some of the men pictured above were killed in the accident. The dead were buried the next day with full military honours in the Barberton Cemetery. 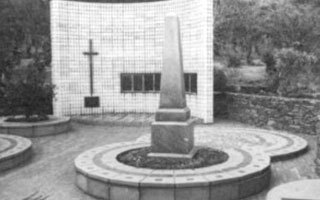 (26) In the absence of a chaplain, Major Crofts read the burial service and one by one each dead soldier was lowered into the ground. (27) It was notably sad that the Volunteer Company had completed their one year’s service and the train journey the day before had ended tragically for ten of their comrades. The remainder of the Company had left the previous Friday. Four further deaths occurred after the funeral, while the 35 who remained in hospital all recovered. Sadly most of the men in the first photograph were killed in the train crash. Second photo is of the bridge today…where you can see the sharp bend in the distance where the accident happened. The names of the men killed is in the Barberton Garden of remembrance.